Simply grand and glorious ! 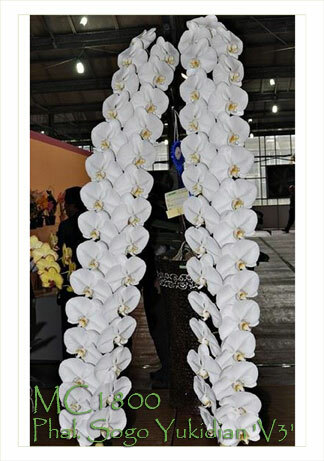 To say all whites are the same is to understate the obvious – Phal. Sogo Yukidian ‘V3’ is an exceptional white. 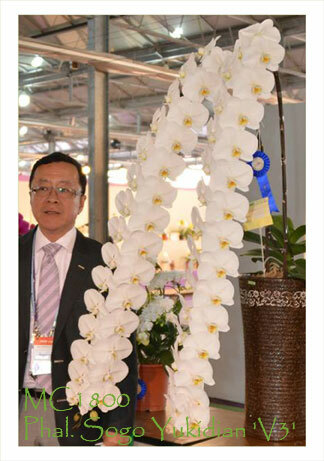 We’ve been fortunate enough to obtain this clone from the same Exhibitor who received the coveted CCE awards from both the American Orchid Society and the Taiwan Orchid Growers’ Association. There are many clones named ‘V3’ on the market, but this particular clone came directly from the propagator of the specimen size plant which also received the AOS Best Specimen Plant at the recent 2014 TIOS Show (see our 2nd photo). Its large pristine white flowers can reach over 4” in size, presented on beautifully shingled and gracefully cascading inflorescences. Very Highly Recommended !